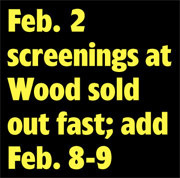 Interest in the new movie Garrow about 1970s Adirondack serial killer Robert Garrow is so intense that this weekend’s two screenings at the 300-seat Charles Wood Theater sold out far in advance and showings have been added for Friday and Saturday, Feb. 8-9. Tix: $20. 518-480-4878. The Chronicle spoke with filmmaker Lori Kelly Bailey. You might call her an Adirondack spitfire. On the phone, she was high energy, fast-talking and occasionally distracted, dropping F-bombs then apologizing, burning dinner and shouting to her son. Ms. Bailey is a registered nurse. She said she was born in her father’s hometown of Mineville, moved away young, returned as an adult to make the remote Adirondack town her own. The 77-minute Garrow is Ms. Bailey’s biggest project to date. 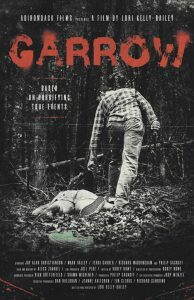 She terms it a “thriller noir” — not a documentary but a true-crime retelling about depraved serial killer Robert F. Garrow, who struck fear across the region and whose prison escape spawned a massive manhunt in 1973. He escaped prison in 1978, triggering a second manhunt. If you were anywhere nearby you knew the story. I was a young kid in a little village outside Albany. Even down there we were gripped, and terrified. The resulting movie, Silent But Deadly, was produced in 2011 in Canada, and enjoys a cult following, judging from the online commentary. Ms. Bailey shares writing credits with three other people. Her narrative centers on the three days Garrow took the stand during his trial — she recreates his testimony and lawyers’ comments nearly word for word, she said — then filled out the story with flashbacks and reenactments of his childhood and his crimes. Ms. Bailey says that as a local, she had rare access to Garrow’s relatives, who she says painted an “insider picture,” sharing memories of Garrow, his children and wife. Garrow’s childhood was terrible. Ms. Bailey says he was likely mentally ill, but when he “acted out” then, he was beaten. 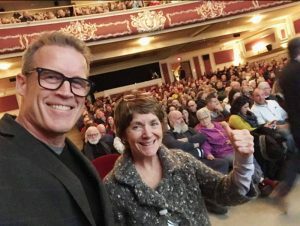 Garrow movie-maker Lori Kelly Bailey, with Mark Valley, an actor in the film, at a sold-out screening at Plattsburgh’s Strand Theatre. She says he likely committed as many as 20 abductions and murders that were never solved or proven; he was convicted of only four. The murders of Daniel Porter and Susan Petz stood out. Garrow was in custody at the time. Ms. Bailey says his lawyers knew where her body was, but, protecting their client, refused to tell. She says the boys who found the body, now grown, still live there. Garrow faked paralysis while on trial. His 1978 prison escape led to the manhunt that ended when he was shot and killed. “We were so relieved. We had relatives here, extremely nervous,” says Ms. Bailey. Garrow comes hard on the heels of Escape at Dannemora, Ben Stiller’s Showtime mini series about the 2015 Clinton Correctional Facility prison escape and pursuit. It stars Benicio del Toro as convicted murderer Richard Matt, Paul Dano as convicted murderer David Sweat and Golden Globe winner Patricia Arquette as prison employee Joyce “Tilley” Mitchell, who became romantically involved with the two men and facilitated their escape. Without Mr. Stiller’s resources, Ms. Bailey said hers wasn’t an easy movie to make. She said her budget of $30,000 depended a lot on favors and lucky chances — including making use of helicopters and other props in town for filming the Dannemora Showtime series. She said many of the actors are locals recreating their own experiences on the Garrow search — or their children. Ms. Bailey’s own daughter plays one of Garrow’s victims. Her son Joel helps on the production and distribution side. Professional actors came in via extended connections or lucky chance. Philip Casnoff is a long-time friend of hers, and Mark Valley was in the region for a convention and needed a room when she had an extra one available in a B&B she’d rented. Jay Alan Christianson plays Garrow. The fright still resonates. Lawrence Gooley’s 2009 book “Terror in the Adirondacks” is a continuing best-seller at the Chronicle Book Fair each November. Ms. Bailey’s regional roll-out of Garrow has seen sold-out and extended runs in Johnstown, Plattsburgh and Watertown, before they even begin to look at festivals. Next: Who’s squeezed most by tax-exempt property in their town?